My mum got tickets to the Welwyn Garden City pantomime for Saturday. She and I took ThingOne along. I was unsure whether ThingOne was old enough for a panto. I figured she'd be OK but you can never tell. It was perfectly possible she'd be bored or scared and wanting to leave after ten minutes. 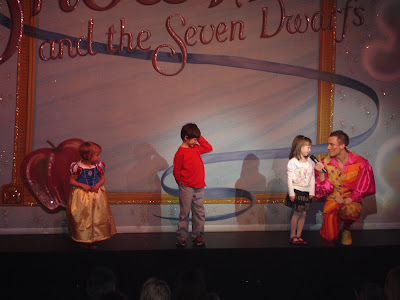 The panto was Snow White and the Seven Dwarfs. She's into her Disney Princesses (shudder) so that gave us a better start than, say, Aladin. 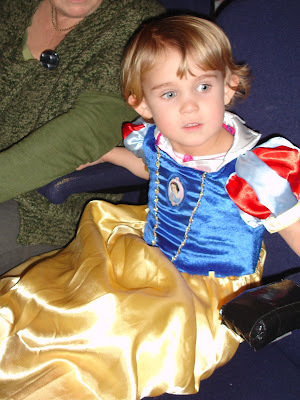 She was most impressed when Granny gave her a Snow White dress to wear there. Having been to play barns and kids' parties over the last few years I fully expected ThingOne to be one of many girls there dressed in these ubiquitous outfits. As it was there was just one other little girl dressed as Snow White. There isn't a Disney Store in WGC, so maybe these clothes aren't as widespread there as they are in Cambridge (though I notice you can get then in Sainsburys and Tesco nowadays). As we walked in people were commenting on her dress, and ThingOne strolled through the foyer seemingly unfazed by all the affection, as if saying "Yes, I'm a beautiful princess. Deal with it." We were soon approached by one of the staff who asked if ThingOne would be OK with going up on stage at the end of the show to do the teapot dance (not a request I often get myself when visit the theatre, but I live in hope). They gave me a numbered card, and I warned the lady I didn't know how ThingOne would cope with the panto and we may have to leave early. She told me that was fine, they always lose a few and that there were three loud bangs in the show. ThingOne enjoyed the show a lot. She was taken aback by the first bang, so sat watching the show with her fingers in her ears until the third bang had passed. Other kids were scared of the baddies, and I heard a couple screaming they wanted to leave, but baddies don't really bother ThingOne (she's fine with them in Disney films and anyway panto villains are at about the level of Robbie Rotten in Lazytown, ThingOne's current favourite show on TV). He asked the kids questions, and a copuple were too shy to answer. ThingOne had no problem, and answered. He asked some kids what they'd asked for for Christmas. I was hoping he'd ask ThingOne, since her plans had now been thrown out as she'd been planning to ask for an umbrella and a princess dress. She'd now changed that to an umbrella and (for some reason) a mouse outfit, which I thought would sound suitably odd. He didn't ask her that, but she answered his questions confidently and then proceeded to do the teapot dance ("I'm a little teapot...") with aplomb. She was the youngest (and by far the smallest) on stage, and I suspect the shyness shown by a couple of the other kids will come with age. ThingOne didn't seem affected by performing in front of hundreds, I'm guessing partly because she couldn't see much of the audience due to the bright lights. I got my camera out to take a photo. My mum told me I wouldn't be allowed to take photos in the theatre. I realised she was right. I took one anyway, got told off by a member of staff and said I had no idea. I got a photo out of it, and realised I'm one of those parents who thinks the rules don't apply to me because my child is special. ThingOne was given a goody bag to leave the stage with, in which she showed no interest even though it contained a balloon and a chocolate selection box. She acted as though it was all nothing while it made her granny's and my day.